Summary: A different type of Grand Canyon backpacking trip which lacks the big views and sweeping vistas, but features some equally beautiful and intimate canyons and grottos. The price of admission to this less visited area is paid in walking, jumping and hopping over many, many rocks. 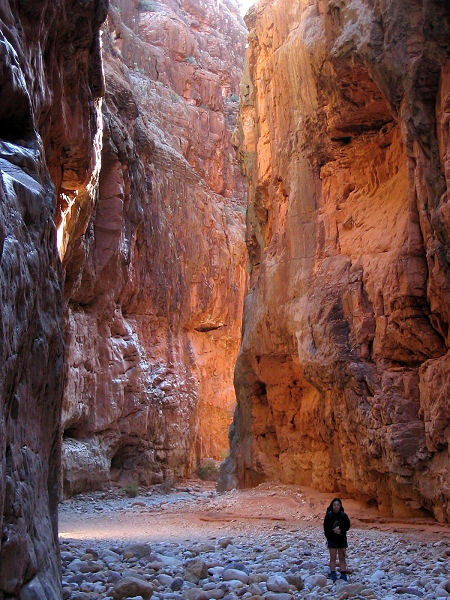 The trip is located on the north rim of the Canyon and follows a route from Sowats Point down Kwagunt Hollow, down Jumpup Canyon and down Kanab Creek to the Colorado River. 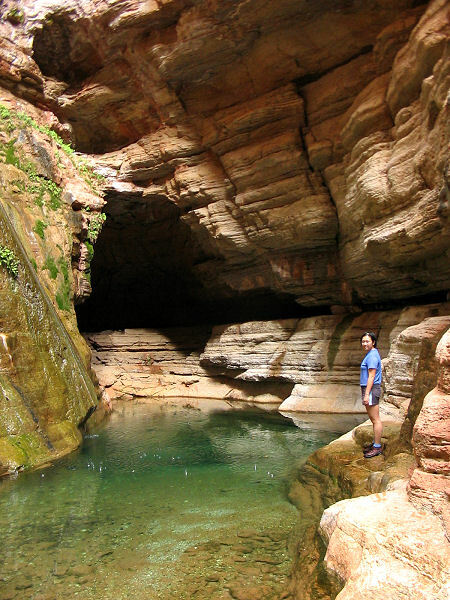 Must see sites along the way include: Showerbath Spring, Scotty's Hollow and Whispering Falls. 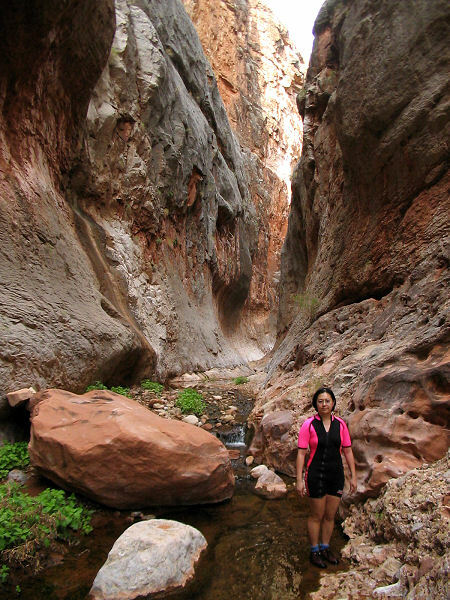 Be sure to bring shoes that you don't mind getting wet, since you will be walking in water much of the time in Kanab Creek. On the positive side, finding drinking water is not a big problem on this hike, since Kanab Creek flows year round below the upper spring. While I wouldn't be overly paranoid about it, you'll want a decent weather forecast to complete this hike. While there are high benches that could be climbed in many parts of the canyons to escape a flash flood, you should be aware that the Kanab drainage is extremely large and can see high flows (as some of the driftwood on the canyon walls will attest). Jumpup Canyon is probably the bigger concern. If it's been raining hard for a few hours, you may want to put off passage through Jumpup for another day. I estimate most people will want to take 4-6 days to complete the trek. Directions: From Flagstaff drive north on Highway 89. Turn left on Highway 89A and drive to Jacob Lake. Head south on Highway 67 for 1/4 mile then turn right on Forest Road (FR) #461 towards the RV Campground. Continue west on FR #461 (stay to the left at the 4.5 mile point where FR #264 branches right) & stay straight 0.8 miles later when it intersects FR #462. Follow FR #462 11.8 miles to FR #22. Preferred Route (shortest and easiest): Turn left (south) on FR #22 and drive 11.5 miles (~5 miles beyond Big Springs), then turn right (west) onto FR #425. Drive approximately 8 miles and turn right onto FR #233. Follow FR#233 9 miles to the trailhead & parking area, which is on the left. Alternate Route (if the above is snowed in, these roads seem to accumulate less snow): Turn right (south) on FR #22. After 8.6 miles, turn right (west) onto FR #447 & drive 3.7 miles to the end. Turn left (south) onto FR #427 and follow it 7.2 miles to where it intersects FR #425 at a 'T' junction. Turn right (west) on FR #425 and follow it 1.7 miles and turn right onto FR #233. Follow FR#233 9 miles to the trailhead & parking area, which is on the left. Hike Description: From the Jumpup - Nail Trailhead, follow the well trodden path past the signpost down towards the canyon rim. You'll pass a trail register, then a few minutes later, a sign indicating you are entering the Kanab Creek Wilderness. 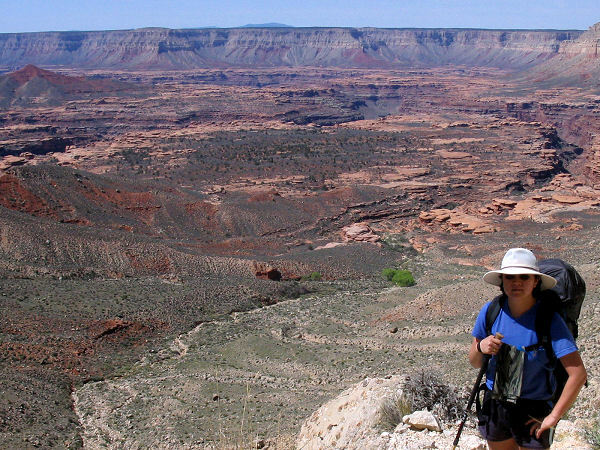 A steeper descent brings you to the canyon rim which, surprisingly, isn't all that scenic. After traversing the canyon rim north a short distance, the path descends very steeply all the way down to the Esplanade far below. A few minutes after passing a prominent stand of cottonwood trees on the left, look for a cairn and use trail which branches left to enter the drainage of Kwagunt Hollow. Simply walk down the streambed of Kwagunt Hollow, which reportedly contains a trickling stream much of the year, and was flowing nicely when I was here. 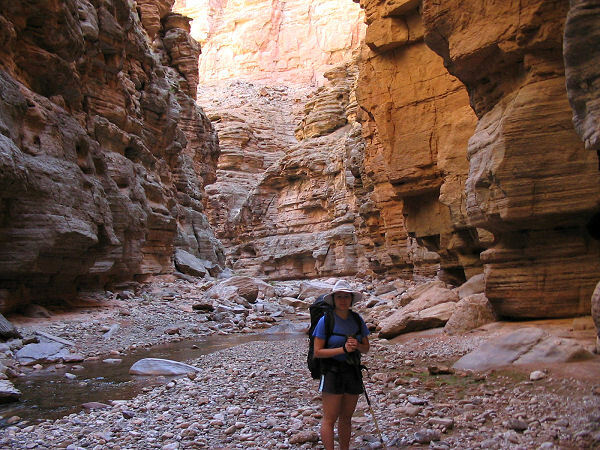 To descend the canyon, you will have to negotiate several sections with large boulders as well as two pour offs, which can both be bypassed on rough use trails on canyon left (the left side of the canyon when facing down stream). Eventually the canyon will level off as it reaches the junction with Jumpup Canyon (which is dry year round). 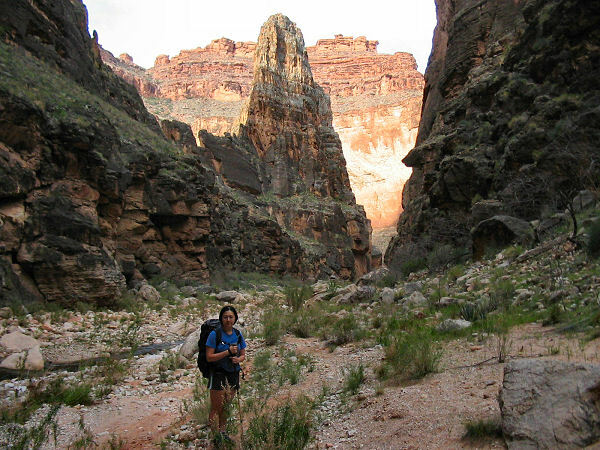 Turn left and begin walking down Jumpup Canyon which soon becomes a slot, becoming deeper and prettier as you go. After ~20 minutes of walking, a prominent drainage will enter from canyon left - this is Indian Hollow. 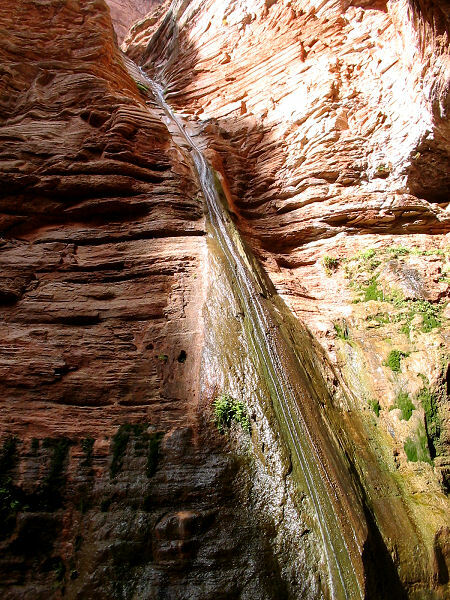 Those in need of water may find a pool and chockstone a short 15 minute walk up this canyon. 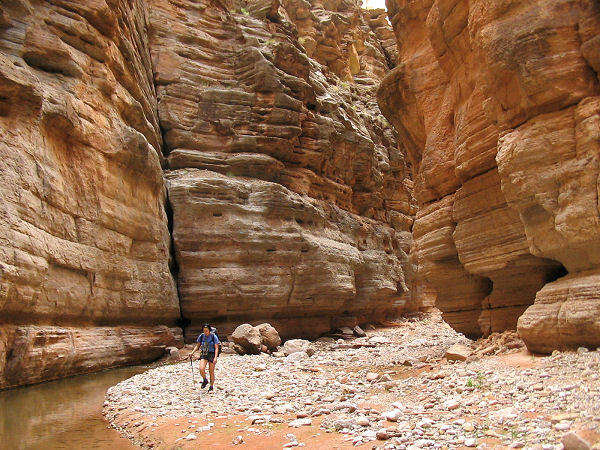 Continuing down Jumpup, it's easy walking as you pass through more deep, scenic canyon until you reach the junction with Kanab Creek (there are several dry camp sites in this area). 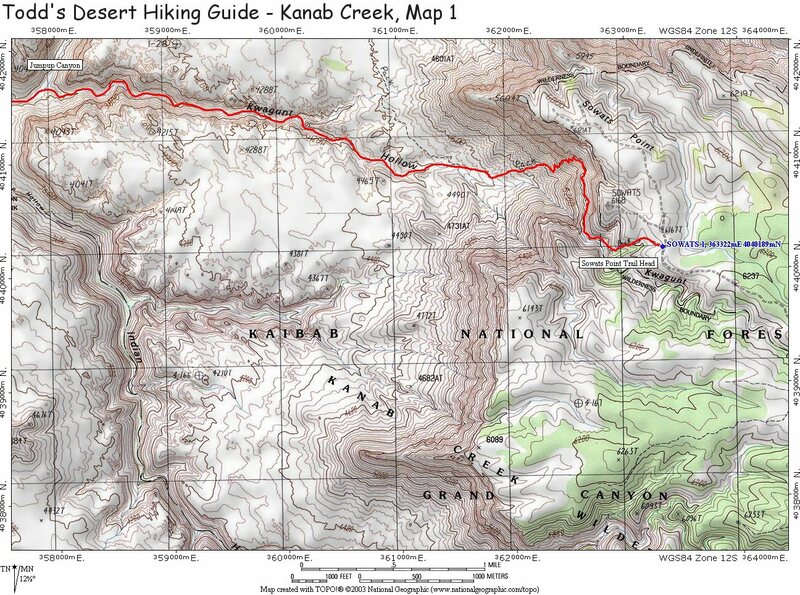 Turn left and walk down Kanab, which is wider and, while nice enough, is not all that exciting. If you haven't gotten used to it by this point, it's all rock hopping all the time as you wind your way down stream (I found it useful to carry the topo map in my hand to follow the bends in the canyon so I could keep track of where I was). About an hour or so of walking and several twists and turns later, you'll reach the point in the map marked 'spring'. Water then appears at the surface of the canyon floor and you will see evidence of beaver activity in the area. The stream is small enough and rocks plentiful enough that you will have no trouble keeping your feet dry at first. However, just prior to reaching Showerbath Spring, water becomes more prevalent and you'll be forced to simply splash through the creek. Showerbath Spring is one of the highlights of the trip and consists of a pretty hanging garden of ferns and monkey flowers with water pouring through the leaves. There is a small camp site in front of the spring. About an hour of walking below Showerbath you'll catch sight of Scotty's Castle (photo below). This landmark is a good one to notice since it marks Scotty's Hollow, a side canyon which enters Kanab on the right. Scotty's Hollow is well worth a side trip and consists of a very pretty canyon and several nice waterfalls. There are a couple climbs and one chest deep wade that you'll have to negotiate to proceed upstream. The author spent 3 hours exploring this canyon up past it's upper forks, but a more leisurely party could easily spend the day enjoying the canyon. Continuing down Kanab Creek from Scotty's Hollow it's more of the same - rock hopping and wading, except with the added difficulty of two sections of canyon which are filled with very large boulders (see map #3). These sections will take additional time to negotiate since you'll have to route find and climb around and through the big rocks. The next scenic side trip lies about 3 hours walking distance below Scotty's Hollow. After reaching a section of canyon where some longer stretches of slickrock shelf appear under foot, look for a side drainage which enters Kanab from the left. A 15 minute walk, followed by a short traverse and a small climb will bring you to a lovely grotto with a small pool fed by Whispering Falls. On a hot summer day, this would make for a great swimming hole, but with the cool air temperatures we found in March we could only enjoy the view. 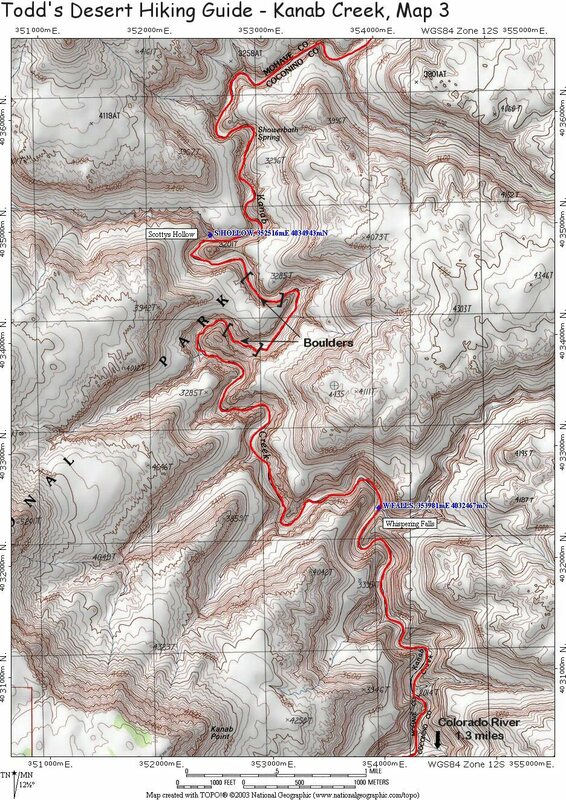 If I were to do this hike again, I would make Whispering Falls my turn around point, since the rest of the hike down Kanab to the Colorado is simply more of the same. 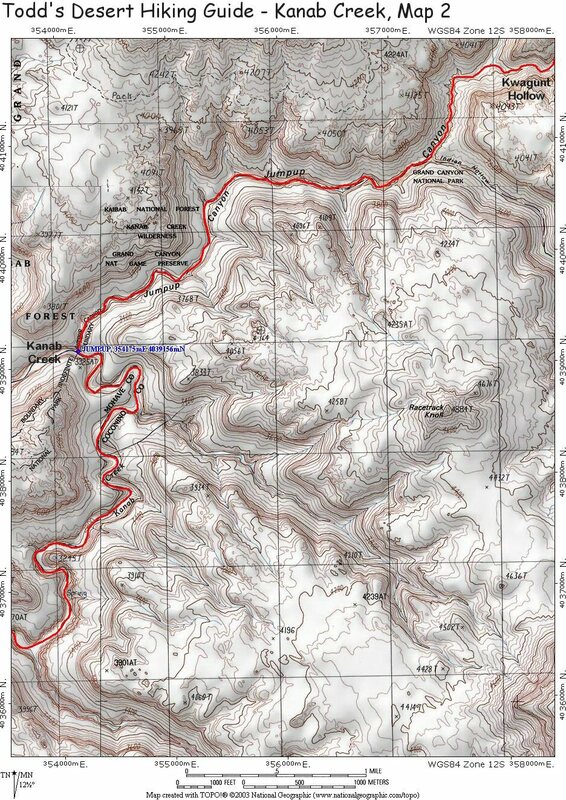 It'll take about 2.5 hours of steady walking to reach the mouth of Kanab, which has a muddy, uninteresting delta, a few rapids and a couple decent campsites which lie atop the grassy knoll on the right side of the canyon. When ready, return the way you came. 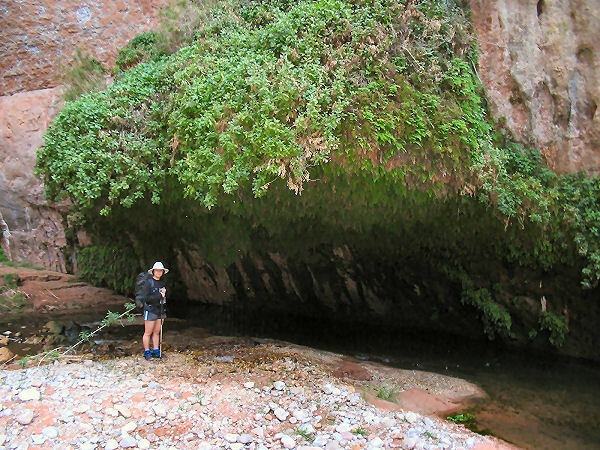 On day 1, the author and his wife hiked down to Kanab Creek and camped on a grassy bench on stream left just above Showerbath Spring exploring up several side drainages along the way (9 hours). On day 2 we hiked down Kanab to a point about 45 minutes below Whispering Falls canyon, exploring up Scotty's Hollow (we brought shorty wet suits for the deep wading) into both upper forks, then up to Whispering Falls along the way (9 hours). On day 3 we took water and snacks and hiked down to the river and back, then picked up our packs and hiked back to the Kanab/Jumpup junction (11 hours). On day 4 we hiked out (6 hours). These hike times are for reference purposes only, your actual times may be quite different. Keep in mind we carried light packs & stopped infrequently for breaks. Scotty's Castle from just upstream. Scotty's Hollow. Kanab Canyon. Whispering Falls. Whispering Falls grotto. Kanab Canyon.